Some cities have a law that requires a hot water heater expansion tank if your home has a closed plumbing system. The installation of a hot water heater thermal tank is required by the International Residential Code of 2012 where the expansion of hot water may cause an increase in pressure and if the water supply system incorporates a back flow device. It is highly recommended that you contact your local jurisdiction to become familiar with what codes are adopted in your area. Codes and regulations vary by cities, counties and states. 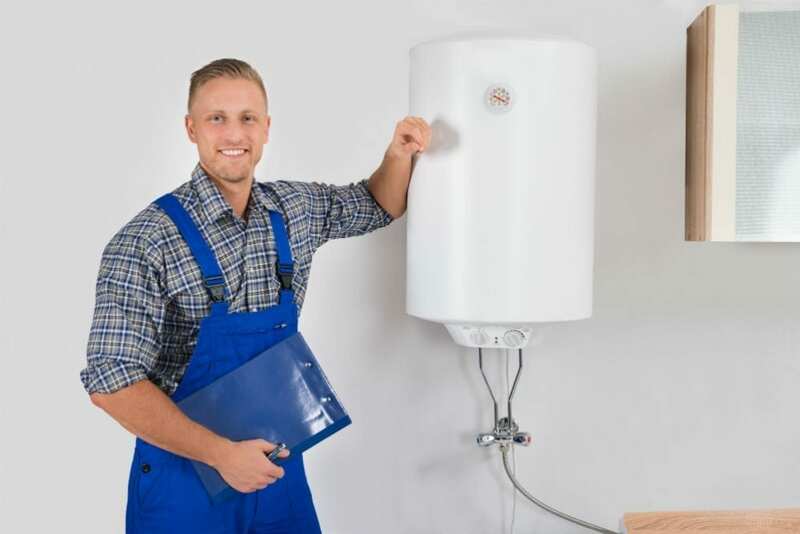 What is a Hot Water Heater Expansion Tank? An expansion tank is a small two-gallon vessel with a rubber bladder inside. A portion of the vessel is filled with air, which compresses when force is applied to it. Water cannot compress. As soon as the air compresses it takes the load applied by thermal increase and relieves the water pressure from the rest of the plumbing. Thermal expansion is the reaction of when water is heated. The millions of molecules begin moving more as the energy increases and maintain a greater than average separation. A standard fifty-gallon unit expands to fifty-two gallons when heated to 120 degrees Fahrenheit, causing the volume of expanded water to rise to dangerous levels. Without a place to accommodate the increased liquid, it pushes out on the hot-water tank’s valve, fittings, gaskets and spigots. Hot water heater tanks are not designed to expand so you need an expansion tank otherwise it may eventually burst. A unit that prevents water from flowing back into the city’s water lines once it enters a home’s plumbing, is referred to as a closed plumbing system. The Environmental Protection Agency in the United States sets strict standards for public systems under the Safe Drinking Water Act. The purpose of this closed system is to stop fluid from flowing back through the supply line, which prevents possible contamination from getting into the city’s main supply. The problem with check valves preventing the water from flow back through the supply line, is that pressure builds up. Once it reaches a certain level, there is a risk of damage to the heater and plumbing fixtures. It is required in Section VIII of the Pressure Vessel Code that heat increase must be addressed in plumbing systems and especially water heater installation. Backflow prevention needs to be in place. A pressure reducing valve is not considered by the code as a thermal expansion tank. Thermal units with Watt series ET-RA, DETA and ETA all meet the American Society of Mechanical Engineers code and requirements. Homes with closed systems should consider installing a pressure reducing hot water heater expansion tank. A water expansion tank can be installed to meet these standards. In response to numerous system failures, Matthias Forney, Henry Rossiter, John Sweet and Alexander Holley founded the American Society of Mechanical Engineers in 1880. Today ASME sets the standards and codes for mechanical devices, provides education, and offers training in almost 160 countries worldwide. Right now they are well-known for setting high standards for various devices. Expansion vessels are manufactured according to the ASME Boiler and Pressure Vessel Code. The BPVC provides codes and rules for the designs, installations, inspections and use of heater expansion tanks. ASME warns that using an expansion tank for anything other than water is unsafe. Instantaneous or sustained pressure that exceeds the listed rating may cause bodily injury and property damage. The American Society of Mechanical Engineers issued a warning stating that only a qualified professional contractor should install a pressure reducing unit in accordance with local ordinances and codes. Improper maintenance, service, adjustment or installation could cause serious bodily harm. In selecting the correct one, you can either use a formula and determine the acceptance volume requirements or use a selection guide. To accommodate high temperatures and pressure systems, you may select from multiple tanks. A non-potable system controls thermal expansion in heating systems, and a potable system regulates the increase in hot water supply. Potable systems are used when the heater tank is isolated from the main supply with no backflow. Non-potable systems can be installed to maintain a balanced pressure and to absorb the increase of water caused by the heating system. Water’s volume increases as soon as it is heated. The small vessel provides space for the increased volume and prevents it from going back into the main supply of the city. In the case where gauges or valves get damaged, the flow is not properly regulated, and a build-up of excessive water occurs. If it does spill out it may ruin flooring, and damage electrical circuits. Valves should always be in good working order and be installed properly. There are many valves outside and inside these units, which can rust or strip with time. Clogged hoses, tubing, relief valve, water hammer and other valves can damage the heater and reduce pressure. If the vessel holds too much water, it causes excess condensation on the outside of the unit. The same problem occur with smaller models that are used more frequently. Water heaters often refill with cold water, causing condensation. Long-term moisture accumulating on the outside may cause rusting. Condensation dripping down onto electrical components is dangerous. The excess water and supply pressure cause puddling on the floor causing the production of mildew. In most existing installations of conventional models, you cannot see the gauge. It is difficult to know how much air the unit has if the glass has clouded internally, or if it is placed where it is not visible. These units are difficult to install and service, as it is required to be placed horizontally. The air cannot be eliminated from the system and remains in direct contact with the liquid. The gauge glass’s seals tend to dry out and allow the air to escape. Conventional units, also referred to as plain steel tanks, included a drain valve, sight or gauge glass and an air fill valve. It is required to install these horizontally at the highest point possible. The ratio of air to water inside is important. It is about two-thirds of liquid and one-third of air. Steel and bladder models both provide a cushion of air for the expansion of heated water. Most expansion vessels used today are the diaphragm or bladder type. Most bladder-type systems are manufactured with galvanized or carbon steel. Galvanizing is the process of applying a zinc coating to prevent rusting. Carbon steel tends to be stronger and harder. A modern unit has either a neoprene or butyl bladder which separates the vessel into two compartments for water and air. Whether you have a 50 gallon water heater or an electric water heater and it has a closed system you need an expansion unit. If you do not have a closed system you can do without an expansion tank. NLA bladder type vessel specifically designed to absorb the forces of water expansion and to control the pressure accumulated in the heating system. The units are usually manufactured in stainless steel or carbon steel with a heavy-duty replaceable Butyl rubber. NTA hydro-pneumatic models are diaphragm type vessels designed to separate the air cushion and system water. The system water is contained in the bladder and the air is held between the outside of the bladder and the tank wall. NA/NAG is a compression type made to absorb the forces of water expansion. It also controls the pressure in the heating system. Plain steel units are installed in the area above the air separation device. Air gets compressed as the water fills up within the system on a pounds per square inch increase. A boiler system designer will usually help home owners determine the size of the unit required against the ratio of air to water inside the vessel. Always ensure that the pilot light is off before you change or inspect any valves. If the heater has an electric igniter, you will need to switch the power off. Do not create any sparks around the gas tank. Perform a thorough inspection for cracks and punctures. It is important to turn off the main water supply if the valve is not working. Expansion vessels are manufactured according to the ASME Boiler and Pressure Vessel Code. They highly recommended that you contact your local jurisdiction to become familiar with what codes are adopted in your area. Codes and regulations vary by states, counties and cities. When installing a new heater installation it can be a little over whelming. Having a licensed professional from your service area is best. The American Society of Mechanical Engineers regularly issues warnings stating that only qualified people should install expansion tanks in accordance with local ordinances and codes. Improper maintenance, service, adjustment or installation can cause serious bodily harm. The requirements for a thermal hot water heater expansion tank is addressed by Standard Plumbing Code, Uniform Plumbing Code and the International Plumbing code. The Pressure Vessel Code and section VIII of the American Society of Mechanical Engineers stipulates the rules and regulations to meet proper construction requirements.